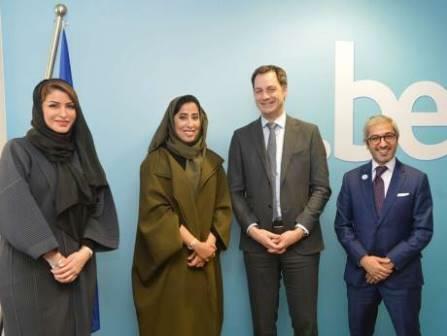 Brussels: A delegation from the UAE Gender Balance Council was received by Alexander De Croo, Deputy Prime Minister and Minister of Development Cooperation of Belgium, on Wednesday. The Gender Balance Council delegation is currently in Brussels as part of an official visit to Europe. The delegation's visit aims to strengthen international partnerships to advance gender balance and explore global best practices in this domain. The delegation is also seeking to share the UAE’s successful experience in implementing gender balance policies with prominent policymakers, thought leaders and women’s organisations in Europe. During the meeting, Vice President of the UAE Gender Balance Council Mona Al Merri hailed the unique ties between UAE and Belgium. She also commended Belgium for its success in advancing gender balance and women’s empowerment in both its government and private sectors. The UAE Gender Balance Council, she said, is keen to exchange knowledge and expertise with Belgium in this area. In her discussions with the Belgian Deputy Prime Minister, Al Merri highlighted the role of the UAE Gender Balance Council in promoting policies and practices that support greater gender balance. Al Merri pointed out that ever since the Council’s inception in 2015, the Gender Balance Council has worked to narrow the gender gap across sectors and raise the UAE’s ranking in global gender balance indices. The Council, she said, also works to enhance the UAE’s contributions to international efforts to achieve the United Nations' Sustainable Development Goals related to gender balance and women’s empowerment. The delegation also met with Herman Van Rompuy, President of the European Policy Center and Monika Ldmanova, Member of Cabinet of Commissioner for justice, consumers and gender equality at the European Commission.